Good golly miss molly. So much have been going on and I feel like I'm a broken record always saying that. Sorry for always sayin so much is going on but really! Life can be so crazy in a calm way. Everyday things. BUT I am being forced to slow down. I'm gonna make a little complaint. As a mother, it's hard not to notice other mother/child relationships. The way they interact with one another. How they show love. How they talk to eachother. Most the time I see other mommys loving and playing with their kids or talking silly. Makes my heart happy. Then there are the other ones. I say "other" ones as in "grumpy" moms. I am so NOT judging because we all have our moments of being pushed over the edge and HELLO PMS! Irritated, kids push our buttons, were tired and kids are acting up. You usually see these grumpy moms at stores ect. Remember, I AM NOT JUDGING! We all know eachother feels! BUUUUT, when I see mothers continually, week after week, be rude, mean, make your child feel stupid....it's NOT ok. I see one specifically. Yelling at their 4 year old daughter, the little girl's hair is cut like a little boy because the mom does not want to put any effort into doing it. (sorry if your daughters hair is totally boy short). Week after week I watch them. Same things always occur. Mom is beyond irritated. Putting the little girl down. She doesn't enjoy the moments and she never expresses that she's proud of her daughter. Other moms around along with myself, compliment our girls, tell them they are doing a great job, they are pretty and show how proud we are. Then there is the other mom. "Hurry up and do this. Get over here! Hurry and change! If you don't stop then we're going home because I'm tired. I don't have time for this. I have better things to do." SAD! Makes my heart sad. Yes we all have our moments. But this has been every week. I'm not judging because I don't know her or her life. But I'm praying for her and their relationship. It's good to be reminded how precious our daughters are. How they need their self esteem boosted. They want to feel like a princess. They want to feel pretty and that they are loved and wanted. As women we want to feel the same. So let's treat our daughters like we want to be treated. Let's rethink how we interact and how much time we really spend investing in them. Teaching them how a woman is supposed to act and how others are to treat her. Manners and sweetness. Let's think about what we really say to them. 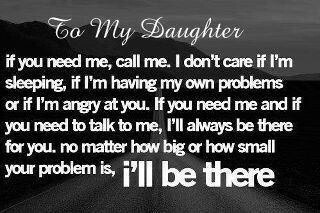 I want the best for my daughter. I want her to not go through things that I did and learn from my mistakes. I want the fairytale ending for my baby. I want what GOD wants for her the most. We love them with all of hearts so let's make the extra effort to show them because one day they won't be running to us for scraped knees but for broken hearts. And you best believe I will be there for both. I couldn't agree more; it hurts my heart to see children who can't even tell you their parents' favorite colors. It's saddening. Hi! I am your newest follower and was hoping that you would hop on over to my blog and follow me back! This is a great post- I think it's a good reminder for all of us to be kind in all of our relationships- not just our kids. Sometimes I will find myself being grumpy or rude to my husband in a way I never would to a stranger or acquaintance- a great reminder to be kinder. Thanks! Just found your blog and have loved getting to know you better. I'm excited to follow along!